What a difference a decade makes. For the first time in ten years, Realogics Group of Companies and its brokers are again representing ten new multi-family for-sale condominium and townhome developments in downtown Seattle and surrounding neighborhoods. Although the project marketing specialists admit the current condo cycle is just a fraction of the last one. Still, the newly announced inventory has spurred the redeployment of a once popular website at UrbanCondominiums.com and a planned opening of a New Developments Preview Center in Belltown. The firm seeks to help prospective homebuyers compare the “new but few” for-sale opportunities in what’s otherwise considered to be anemic condo supply in the city. The reality is despite the rising demand to own, developers (and their construction lenders) have overwhelmingly preferred to build apartments for rent in recent years. In fact, of the 27,000 new housing units being developed in downtown Seattle this decade more than 94-percent of this supply will deliver for lease and not for purchase. At this time a decade ago, developers of more than a dozen high-profile condominium projects were advertising presales in The Seattle Times. All that activity fueled property search websites, such as UrbanCondominiums.com (owned and operated by local real estate marketing company Realogics, Inc.). Back then, the regional housing market was coming off of a record year of median home price growth, there were more than 3,000 condominiums in development planning and most were available for presale. Mortgage lending and consumer confidence was supporting record sales but there were clouds forming on the economic horizon including indications that the US stock market, led by the Dow Jones Industrial Average, was coming off its 2007 market peaks. Within a few months the bloom had fallen off the rose, the US entered the Great Recession and construction capital and consumer confidence collapsed and many mortgage lending options dried up. 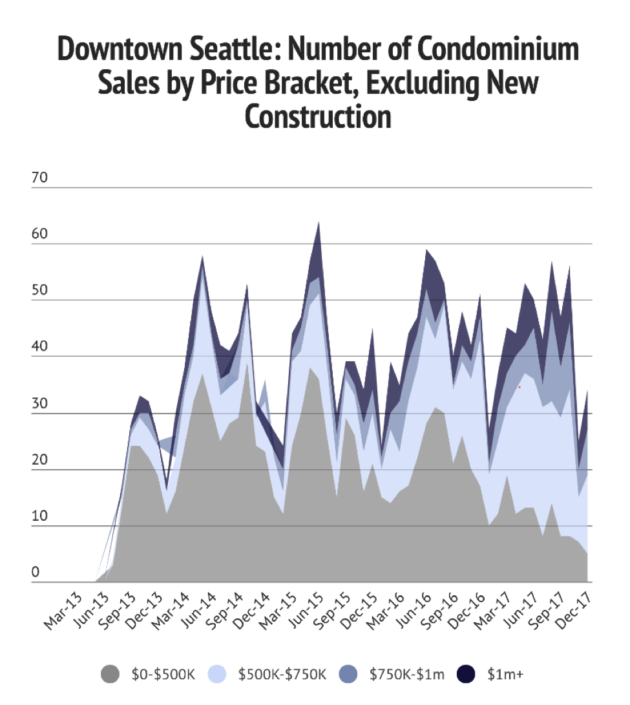 Above: A report by Realogics illustrates the supply of new condominiums in their year of substantial completion as well as the present status of sales - clearly the boom of new for-sale developments a decade ago is not replicated in more modern times, despite the market fundamentals being substantially better. Above: The Dow Jones Industrial Average today is approximately twice the value it was before the Great Recession and is one of the reasons savvy investors are looking for alternative investments like real estate. Fast forward to today, and downtown Seattle is a fundamentally different market and in a much better economic position, even during the best of times in the past cycles, according to Jones. Above: Downtown Seattle lost a considerable number of jobs during the Great Recession but quickly recovered and has since established a new benchmark of employment thanks to robust hiring at urban tech firms like Amazon.com (source: DowntownSeattle.org). To be sure, the mortgage lending industry is operating with a materially different set of guidelines today with numerous safeguards. Above & Below: The number of home sales and the number of available listings offered for sale below $750,000 has been in dramatic decline within the resale market as median home prices rise and new construction offerings, few as they are, struggle to deliver meaningful numbers of homes at more affordable price points. Located in Seattle’s own “Central Park”, Florera offers urban conveniences, while just steps away from the bucolic Green Lake and its vibrant surrounding neighborhood, awaiting the anticipated arrival of the LINK light rail at NE 65th Avenue and Roosevelt Way NE. Designed to be eco-friendly the building is LEED Silver certified. Ideally located between Mount Baker and the Columbia City Light Rail stations, the Central Townhomes provide true in-city location with access to multiple points of the city. Designer accents can be found throughout the 3-bedroom homes, plus the incredible benefit of an attached oversized one-car garage. Three thoughtfully-designed townhomes outfitted with endless options for a tech-savvy resident. Prewiring for various cutting-edge in-home tech tools, as well as solar panels complete these private homes, all with garage and off-street parking, as well as private rooftops with views of downtown Seattle. Enjoy the conveniences of West Seattle’s Alaska Junction neighborhood. A rare opportunity for modern design, city lifestyle, and expansive floor plan can be found in two 4-unit townhome developments in Madison Valley. Open spaces with floor-to-ceiling windows, garage parking, and private roof decks. More details to come, but stay tuned for information on 111 26th Avenue E and 123 26th Avenue E.
Experience 200-degrees of spectactular vistas of the skyline, Elliott Bay, and the Olympic Mountains in this 11-unit boutique building. Perched at the tip of Alki Point, The Pinnacle at Alki exudes northwest contemporary design with floor-to-ceiling windows, uncompromising quality, and outdoor living spaces with each unit. Just steps to Luna Park and a short walk to the Seattle Water Taxi, residents can have the offerings of downtown nearby while enjoying a West Seattle water retreat. Unmatched quality and craftsmanship can be found in this collection of 5 elegant residences designed by award-winning architecture firm, Garret Cord Werner. Each three-bedroom townhome offers grand entertaining spaces framed by 12-foot walls of windows. Unobstructed westerly views from Gas Works Park to Downtown Seattle and beyond. Perfectly placed in the heart of Columbia City, Sonata is the urban answer that connects its residents to all the city has to offer. Contemporary style, a variety of floor plans, thoughtful amenities, all just steps from the LINK Light Rail. A vertical neighborhood with hotel-like and professional amenities, located in the vibrant “East Village” of Seattle. The next generation of in-city high-rise, featuring panoramic vistas and more than 25,000 square feet of interior and exterior amenities. 90% sold. Downtown Seattle’s historic Chinatown-International District has long been home to culture, cuisine and conveniences befitting of its urban renaissance. At its heart is KODA, an artfully-inspired condominium that is set to rise at the corner of 5th Avenue and Main Street. Homeownership is finally within reach as is modern design, dynamic amenities and immediate access to the regional transportation hub at King Street Station and all that downtown Seattle has to offer. For more information, register online at UrbanCondominiums.com or stop by the New Developments Preview Center located at 2715 1st Avenue in downtown Seattle (open daily 11am-5pm). The official opening is scheduled for mid-February 2018. Read more in NEW ERA OF CONDOS by Portrait of Seattle Magazine.